As soon as your payment has gone through, you will receive an 'Order Complete' screen, containing a bright yellow box like the one below. A copy of this will also be sent to the email address you provided, in case you lose the link. When you click on the link, you should see a pop-up box like the ones below. If you use Internet Explorer, it should look like the box on the left, if you use Firefox, it should look like the box on the right. The warning sign will always appear on the IE box - but don't worry - all my files are virus checked! 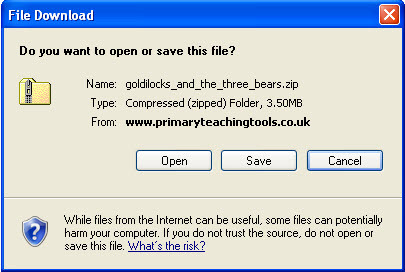 Make sure you choose 'Save' - the files are in a zipped format, and cannot be opened straight away, they need to be downloaded first. You will be given the option of where to save them - see the screen below. (I have chosen the Download folder). This may take a while with some resources, depending on their size. When this is saved, open the folder that contains your resources. It should look similar to the one below. You then need to right-click the folder, and choose 'extract all'. 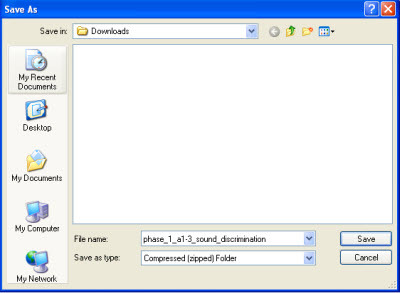 This will allow you to specify a location to unzip your files to. If you have any problems, do not hesitate to contact us. If you are using Google Chrome, then the files may automatically download when you click on the link. In this case, a tab will appear at the bottom of the screen. 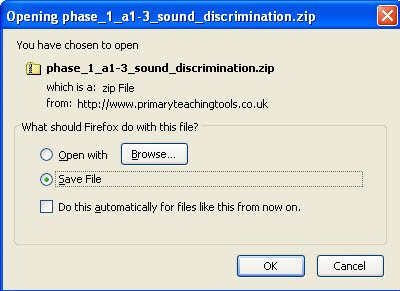 All you need to do is click on this tab and it will open the folder where the zip file has been downloaded to. If you would like to test out downloading zipped resources, use the link above.